You can store reviews in OwnerRez by either manually entering them one by one or by importing them in bulk via Excel spreadsheet. This article will cover entering them manually one by one. When a guest writes a review on a listing site, social media website or in a guest comment book, you can manually enter it in OwnerRez by following these instructions. First, determine if the review was for a specific booking. 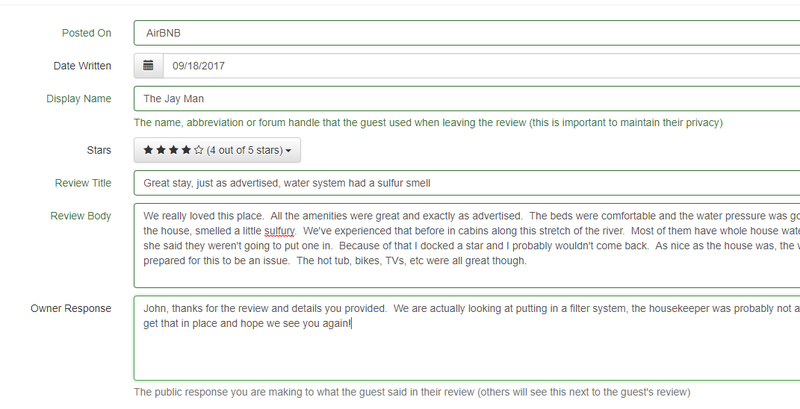 You can usually tell this by the name on the review, the month of stay (as shown on the review) and the details that they left. It is important to physically map the review to a specific booking, because OwnerRez can use review data to make intelligent automated decisions, so do that first. Most of the time, you can figure out which booking it was for. Then, navigate to the booking in OwnerRez and click on the Reviews tab and then on the "Record New Review" button. If for some reason you can't figure out the specific booking that the review applies to, you can still enter the review. To do that, click the global Reviews menu and then click the "Record New Review" button above the grid. After you click the "Record New Review" button, the page will load and you'll see a number of data-entry fields for all the normal things that go with a review. * Only shows if you're entering the review from the global Reviews menu. If entering the review on a booking, the Property and Month of Stay are already know by virtue of the booking. If you are manually editing a review that was originally imported in bulk, and you see a bunch of metadata fields filled in that you don't recognize, do not remove those metadata values. It's important to retain the metadata so that merging and matching can happen successfully as reviews are imported in the future. Enter in everything you can by copy and pasting from the review that the guest left online. Don't leave anything out. If you didn't enter an Owner Response online but want to do that now, you can do that, but keep in mind that the review data in OwnerRez will not be pushed back to the listing site. 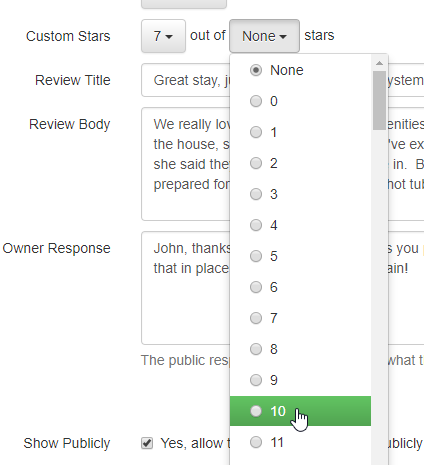 So your owner response will only be seen on your own website and the other places where you use your OwnerRez reviews. When you're finished, click the Save button and you're all done! There are a couple of common problems that users tend to run into. If you have a problem with reviews, check out the below sections to see if one of these sounds familiar. Not all listing sites, or social media websites, give you "[x] out of 5" stars to pick from. Some are 1-3 stars. Some are like/dislike only or have no stars at all. We designed our review system to support all of those constructs. When you select the Stars drop-down in the data entry page, you'll notice a number of star options. At the top is a "None" option. If the review you're entering has no stars associated with it, select None. This is common for reviews left in guest books or places where there's a written testimonial. Do not select the "0 stars" option or that will look like a bad score. The "None" option will correctly show that no stars were available. 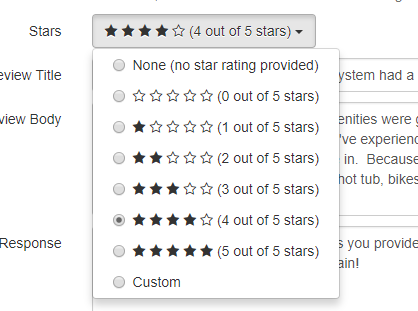 The "0 - 5 star" options are exactly what they look like. This should reflect what the guest selected on the listing site. At the bottom is a "Custom" option. When you select that, you'll see a field called "Custom Stars" appear where you can select Stars Given and Stars Max. This lets you define exactly what was given so that 3-star or 10-star ratings (or any other number) are all possible to enter. The correct % ranking will still be calculated under the covers so that all reviews, across all listing sites, are weighted the same way. Some listing sites, or social media websites, allow the guest to insert rich text or attach photos. We do not currently support that type of content. If this becomes a major need, we'll look into adding it later, but for the time being, you can only store plain text reviews in OwnerRez. The vast majority of listing sites only do plain text reviews, so we feel that it adequately covers 99% of what you'll need.